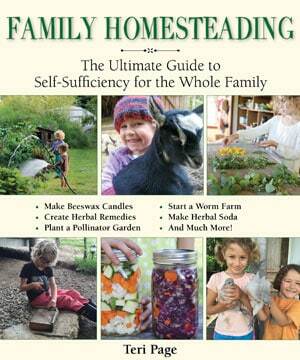 Did you know that you can make syrup from trees growing in your own backyard? It’s true! 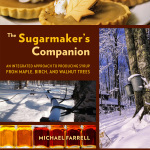 You don’t need a lot of acreage and a sugarbush to tap trees and make delicious syrup. Our family tapped only 14 black walnut trees last winter, and made 5 quarts of syrup – enough to last our family of four for close to one year! Tapping is easy, fun, and is a great activity to do with children. Plus homemade syrup is an outstanding natural sweetener to add to baked goods and desserts. Here’s how to get started making syrup in your backyard. And this list is not exhaustive! Glass mason jars and canning lids and rings, or other appropriate storage containers for the delicious syrup you’ll make! 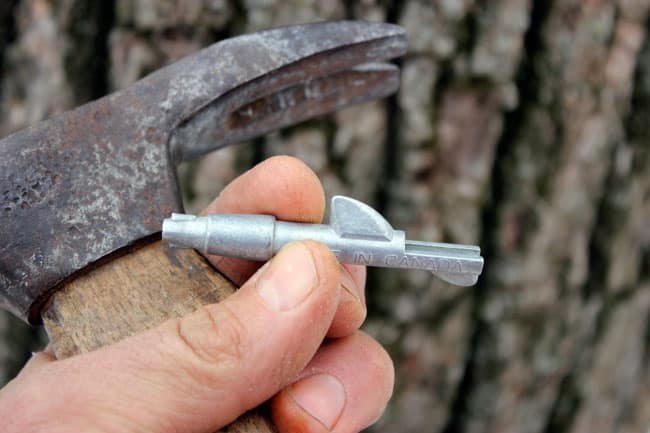 Generally speaking, ideal tapping temperatures are below freezing at night (around 20 degrees F is ideal) and above freezing temperatures during the day (40 – 50 degrees F). In our area of NE Missouri these temperatures are usually achieved in late February, but this year we’re experimenting with a midwinter tapping in January since we’ve had a few weeks of warm days. We actually almost missed a tapping season by relying too heavily on the calendar and not the weather. You can always tap a close by tree if you think conditions are right, and watch to see how much sap flows. We do daily sap walks to collect sap, which is a great way to get out in nature and get some fresh air and exercise. We have our trees flagged with bright orange tape so it’s easy to quickly spot the tapped trees and collect the sap. Having a few eager helpers is especially useful! Step Five: Boil it Down! 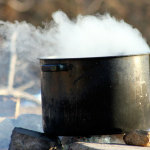 We boil our sap on an open campfire in our yard. 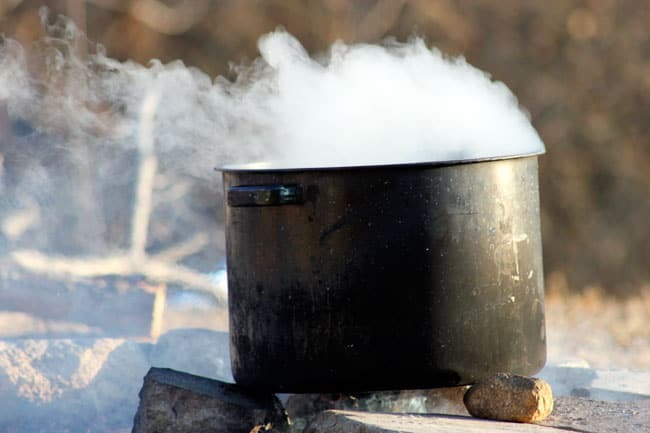 Larger sugaring operations will use specialized evaporators, but we’ve found that our simple method works great for boiling down small amounts of sap. You might also try a propane stove, but I’d recommend NOT boiling sap down in your home, as it can leave a very sticky condensation on your walls (ask me how I know this!). We use a simple canning pot, but the boiling down process would proceed more quickly if we found a more shallow, rectangular pot to increase surface area for better evaporation. I’m keeping my eye on local thrift stores for the perfect pot for making syrup! After boiling down our black walnut syrup, we typically sterilize glass mason jars, make sure the syrup is at least 180 degrees F, pour the syrup into the jars, and top with a canning lid and ring. We do not use a hot water bath to further process the syrup, although some will say that it is best to do so. If you feel more comfortable sealing your jars of syrup with a hot water bath, then process the jars for 10 minutes. Syrup is best stored in a cool place away from bright light. I have successfully stored homemade syrup for over a year. 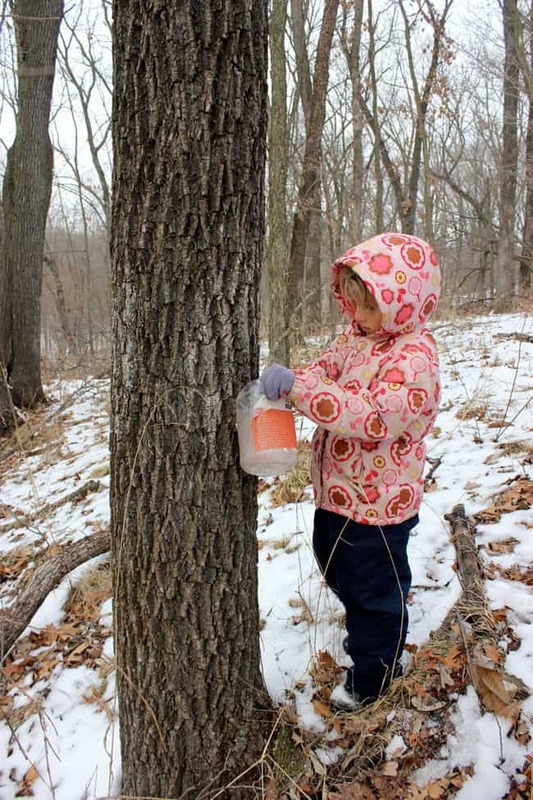 Making syrup from your own backyard trees is a fun, rewarding, and delicious process. By tapping even just a few trees in your backyard (or maybe your neighbors backyard) you can make your own all-natural sweetener. 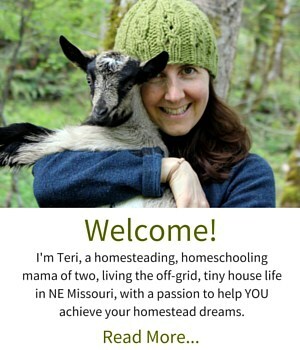 So exciting:)!…I just opened this post and asked the kids if we have black walnut trees on the new land and they reminded me yes!!! Hoping this is in our future too! How brilliant it must be to be able to tap your own trees! I had no idea you could get syrup from trees other than maple. Sadly (or maybe not, I hate the cold! ), we don’t get the temperature requirements. Maybe it’s the reward we get for enduring the cold winter! 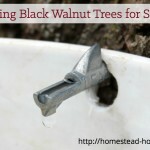 Interesting, we tap our Maples, but I never really thought about tapping black walnuts. I may have to give this a shot. Is the syrup much different? It’s sweet and thick and delicious, so in that way black walnut syrup is similar to maple syrup. But it has a really distinctive flavor that I describe as “nutty” and “earthy.” I really enjoy it! 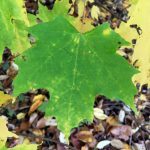 Do you know anyone with Maples or any of those other trees in their backyard? You might be able to do it this year! I am so excited to try tapping this year for the first time. My son’s class did it at school last year, so he will be my expert! We’ve already gotten 10 spiles and tubing. We have some black walnut trees and some maples. Do you think we should keep their sap separate ? We were planning to, but not sure about mixing. Can’t wait for late winter! (Home on a snow day for the big New England blizzard today!). 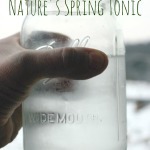 I’d say it’s up to you if you decide to mix the sap, but my personal opinion is that you should reserve some of the black walnut sap to boil down separately, as it’s a truly unique flavor! I love as far South in Alabama as you can get, and this didn’t seem like something I could do. But from your description of the weather needed, I guess I can! I’m not an expert on Southern trees by any means, but I believe that the weather has to be almost freezing for a few weeks for the sap to have the high sugar content that you’d need to tap. I’d ask your local Extension Service and see what they have to say! Do you water-bath can your syrup for longer storage? If so how long? Kate, At the end of the season, we took all of the small amounts of syrup, combined them into a big pot and gave them one more boil. We then poured them into sterilized mason jars, and put lids on them. We did NOT actually water bath them, but the lids did seal and we have had no troubles storing the syrup on a pantry shelf for an entire year. Glad it was helpful! Let me know how the tapping goes! My husband made delicious maple wine from the sap from his parents property. We have discovered that we have several black walnut trees on our property and have been collecting the sap to make walnut wine. I will let you know how it turns out! Oh, that sounds delicious! Yes, please do let me know how it turns out! I have heard great things about Bigleaf maple syrup, which makes me kick myself for not having tried it when we lived in Oregon, surrounded by Bigleaf maple!! But the black walnut syrup is quite lovely!